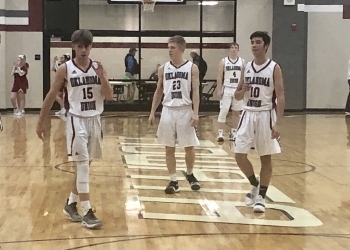 Fifth-ranked Oklahoma Union closed out the regular season with a 77-48 win over Nowata. The Cougars will head into the playoffs with a fifteen-game winning streak. Nowata’s loss drops them to 15-6 on the year. Oklahoma Union forced the Ironmen to play catch up in the first half. The Cougars led 21-10 after one quarter. Nowata kept it close in the second quarter, at one point reducing the lead to nine points. However, freshman Kade Hollingshead hit this three-pointer to put OKU up 36-24 at half. Nowata would score a couple of quick buckets out of the locker room, but the Cougars would eventually start pouring it on. OKU went on an 11-3 run and then a 10-0 run at two separate points in the third period. They led 60-31 by the end of the quarter and would hold on down the stretch for the victory. Dillon Barnes scrapped hard for the Ironmen. He led the team with 21 points, a new season high. That included this acrobatic bucket to pull the Ironmen closer. Both teams have home games and first-round byes in the district playoffs. OKU will play the winner on Colcord and Afton. Nowata hosts the winner of Ketchum and Fairland. Both games will be played at 8 p.m. on Saturday. With the early byes both teams will automatically advance to play in the Nowata regional which is slated to start Thursday, Feb. 21.